Asurion is an extremely popular phone insurer, but most Asurion policyholders may not even know they’re with the company, which does not actually sell insurance directly to consumers. Rather, Asurion works with three of the big four US carriers (and numerous others) as their officially endorsed subscriber phone insurance provider. As such, cost, deductibles, and coverage vary by which carrier you’re with to a significant degree, though most of the terms are generally consistent. You also have to be a subscriber of a carrier in order to take advantage of that carrier’s insurance plans. Here’s what you need to know. Asurion covers loss, theft, accidental damage, and malfunction – the big ones most people file claims for. Once your insurance claim is approved, you’ll be told if Asurion is electing to repair or replace the device, if it’s the latter, they’ll ship it out to you overnight. It may be new, or it may be refurbished. A phone charger, battery, and a SIM card will be included. But let’s get to the fine print, because that’s where things get interesting. Other more obvious reasons for denial of claims include problems that are covered under the existing manufacturer’s warranty, damage caused attempting to repair or modify a device, or vermin. Yes, if insects, rodents, or “other vermin” damage your phone, that’s not covered. I don’t even want to know. If you submit a claim for a lost or stolen phone, Asurion may require (TOS varies per carrier) that you file a police report, obtain a copy or case number, the police station’s phone number, and the name and badge number of the officer who took the report. Asurion may not ever request you to submit the report or this information to them, but make no mistake: you may be required to do it under the terms of the policy. Finally, as with most contracts you’ll agree to as a consumer, Asurion requires you to agree to an arbitration clause, which essentially means you can’t sue them outside of a limited number of circumstances, only pursue an arbitration hearing. This only applies in some states, however, so check the fine print at the very bottom of this document if you’re interested in which ones are excluded. AT&T Mobile Insurance is $6.99 per month with the “insurance only” option, and covers the same loss incidents as every other Asurion plan (accidental damage, loss, theft, and post-warranty mechanical breakdown). 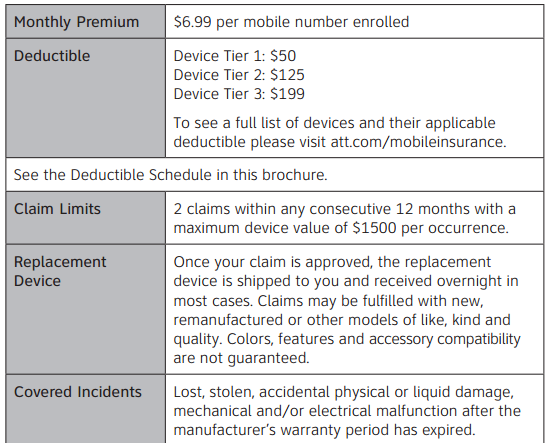 AT&T has three deductible tiers (1, 2, 3), with any high-end smartphone landing in the tier 3 $199 deductible. A few less common mid-range phones will get you down to the $125 tier 2 level, and low-end devices like the Galaxy S III Mini even manage to make it down to tier 1 at $50. Like Verizon, you’re limited to two claims per 12 months of enrollment. Unlike Verizon or Sprint, AT&T’s policy includes, if you mention it in the claim filing as part of your loss, a replacement for one of the following: carrying case, automobile cigarette lighter adapter, or standard wired earpiece. I guess that’s kind of nice of them. This is in addition to the battery, charger, and SIM card, if you’re claiming them. AT&T’s policy on claims requiring you to return your damage device states that you have 10 days to send it back from the date you received the prepaid shipping label. Sprint’s Total Equipment Protection plan is currently offered at either $8 or $11 a month, depending on what deductible tier your device is in. Most mid-range to high-end phones are in tier 3, meaning a deductible of $150, and a monthly premium of $11. The Note phones are among the few that land the big $200 deductible, though the iPhone 5 / 5S / 5C may also end up there, as well. Unlike Verizon and AT&T, though, Sprint’s TEP plan covers up to three claims per year, with the same $1500 per claim limit. This is a significant advantage over the Verizon / AT&T plans if you’re particularly likely to break or lose your phone, though you’re obviously paying for it – the monthly premium is nearly double that of AT&T’s. Otherwise, this plan is just like AT&T and Verizon’s, and offers the same level of coverage for the same loss situations. 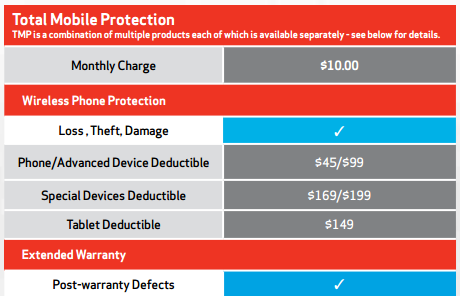 Verizon’s Total Mobile Protection comes in at $10 a month with a maximum of two claims per 12 months at $1500 apiece. However, Verizon does have one apparent advantage over pretty much every other plan here: deductible rates are substantially lower. Most high-end Android phones have a $99 deductible, even devices like the Galaxy Note II, LG G2, or Galaxy S4. While Verizon does have deductible tiers at $149, $169, and $199, the only devices I’ve seen at those deductibles are Apple products or tablets. This plan covers the same sort of thing we’ve seen already – loss, theft, damage, and malfunction. Verizon also offers cheaper plans, though. For $8 a month, you can get the Total Equipment Coverage (TEC) plan, which is like the TMP plan above, minus the lost phone / “tech coach” support line features you don’t need. I’m pretty sure you have to sign up for this plan in-store or over the phone, and that it has to be within a certain time frame of your device purchase. Finally, there’s the simple extended warranty plan. For $3 a month, you can extend your phone’s warranty for malfunctions and defects that would otherwise be covered past the first year you have the phone. Again, all these plans aside from TMP probably have to be bought at a store or over the phone, as I can’t find a signup page on Verizon’s site. If you’re on one of T-Mobile’s new monthly handset repayment plans (JUMP! ), PHP is included at no extra cost beyond the $10 JUMP fee you’re already paying. Your deductible depends on just what phone you have, with there being five deductible tiers. Most modern high-end smartphones fall into the two highest tiers, meaning a deductible of $150-175 in the event of a claim. There is also a $5 warranty processing fee every time you make a mechanical breakdown claim, and you’re limited to two claims for every 12 months you’re enrolled in the plan. Assurant sends you a refurbished replacement handset within 1-2 business days (though customer accounts of turnarounds seem to vary), and if a refurbished phone isn’t available, a new one will be sent. Additionally, each refurb comes with a 6-month warranty. If you’re not on JUMP, premium handset protection is an $8 / month add-on to your T-Mobile account, and includes the same coverage and deductibles as the JUMP version. SquareTrade is probably the most popular non-carrier phone insurer in the US. They have low deductibles ($99 for pretty much any non-iPhone), simple coverage terms, and they’ll even give you a big discount if you buy a 2-year policy ($125) up front instead of going month to month ($7.99). What SquareTrade doesn’t do is loss or theft coverage – your phone has to be in your possession in order to make a claim under your policy. As such, the warranty only covers accidental damage and malfunction, and you generally have to purchase the policy within 30 days of buying the phone. SquareTrade also has a major advantage over competitors in the event your phone is deemed beyond repair: they’ll just pay you the cost of replacing it (by their estimate – meaning the cost of a refurbished device, usually) once you submit your deductible payment. They’ll even send they money directly to your PayPal account. SquareTrade, unlike many phone insurers, doesn’t deal in refurbished smartphones, and would prefer just to pay out if they can’t fix your device. Reviews of SquareTrade on the web are generally very positive, though like any service you’ll find sour grapes here and there if you go looking. The practical drawbacks? Shipping is generally 2-day, and because SquareTrade only repairs your phone or reimburses you via PayPal / mailed check, that means you’ll probably be without a phone for a week or more. Now, what isn’t covered under a SquareTrade plan, aside from the aforementioned loss / theft? Exposure to weather conditions, failure to properly clean, operator negligence, misuse, abuse, improper electrical / power supply, improper equipment modifications, attachments or installation or assembly, vandalism, animal or insect infestation, battery leakage, or “act[s] of nature” or any other “peril” originating outside the product. So if your phone is struck by lightning or short-circuited by fire ants, you’re probably out of luck. But as far as the damage scenarios that are likely to occur to a smartphone, you’re pretty well-covered. If anyone is promising you “no deductible” on your phone insurance claims, they’re probably stretching the truth. A lot. Most such services actually hide behind the term “administrative fee” (for example, ProtectCell). Yes, there’s no deductible as part of your plan as far as the wording of the policy is concerned, but oh wait, there is a $150 “administrative fee” you’re going to have to pay if you make a claim. And it goes up to $200 if you make a second or third claim. You know, for all those expenses incurred administering your policy. Right. That said, here are a few other providers that have at least a semblance of reputability, and their rates and coverage based on insuring a Galaxy S4 (in Worth’s case, a $599 policy). Worth Ave. Group: $59 / year. Covers drops, water damage, and theft (not loss). Deductible: $50. Pays out amount insured – no replacement devices or repairs offered. Best Buy Geek Squad Protection: $9.99 / month or $199.98 / 2 years. Covers drops, water damage, and other malfunctions. Deductible: $150. Repairs existing handset if possible, if not, replaces with refurbished or new handset of same or like model. (Note: the deductibles were added and pricing changed as of Sept. 1st, 2013 – non-deductible coverage for new customers is no longer available). Ensquared: $58.99 / year or $99.99 for 2 years. Covers drops, water damage, theft, and loss.Deductible: $100. Repairs existing handset if possible, if not, replaces with refurbished or new handset of same or like model. I can’t cover every plan here. With smaller providers like some of the examples I listed above, you’re really taking something of a gamble on your policy. Adjusters may be more shrewd, customer service poorer, and the likelihood you’ll be denied a claim based on a technicality higher. The insurance business is about pooling risk – the bigger the pool, the lower the risk to the insurer. The smaller the pool, the more vigilant the insurer has to be about enforcing fine print and keeping costs down. Just remember that. Most modern smartphones have a retail MSRP over $500 these days, and as such, qualify pretty easily under most homeowners and renters insurance as a valuable possession that can be covered under your policy. This is a very case-by-case solution to insuring your phone – so specifics on cost here are hard to measure – but the general consensus I’ve found in terms of estimates are anywhere between $10 and $50 a year on top of your existing policy, depending on your insurer and the value of your phone. Note that this is different from merely claiming your phone as personal property on your homeowners in the event of a covered loss – you’re adding specific coverage for this possession as a valuable personal article. How do you go about insuring your phone this way? You’ll have to call your insurer or the agent who handles your policy and request that they add a rider (aka floater) provision to your existing policy specifically for your smartphone(s). You may need to provide a receipt or other proof of your phone’s value, but once you do, it’s covered. The best part? Most rider provisions have no deductible, and you’ll be reimbursed the full insured value of the item in the event of a loss. Exactly what situations your phone is covered under will vary, but generally personal article riders cover a very broad number of scenarios. That means you will not be limited to only the loss situations covered under your larger policy, which are substantially fewer. You’ll only be limited to the specific exclusions of the rider, which you should of course ask for. In the event of a loss, though, you do have to weigh the value of making a claim on your homeowners or renters insurance for a single item (if your phone is all that is claimed), as your rates will likely go up substantially when you renew the policy. You could also potentially be dropped by your insurer, an increasingly common practice. And every time you get a new phone, you’ll have to call your insurer to get rid of the old rider and add a new one. Is this more complicated than just buying a phone insurance plan? Yes. Is it probably worth doing if you already have a homeowners / renters policy anyway? Even at the high end of $50 a year (around $4 a month), it’s hard to argue with the value. It’s a little extra peace of mind, if nothing else. While you’re at it, you can also insure other expensive gizmos this way – high-end photo gear and laptops, for example. You may not want to claim any of these things alone on your homeowners, but in the event something happens that results in the loss of numerous valuables (eg, your car is broken into while you’re at a hotel and your laptop, phone, and camera are all stolen), it may just be worth it. Be sure to ask about international loss coverage as well – many insurers restrict these policies to domestic claims. Did you buy your phone with a credit card? Many credit card processors like Discover offer extended warranties on products purchased using your card. Oftentimes, this warranty extends 1 year past the date of the expiration of the manufacturer’s warranty. Obviously this won’t cover things like accidental damage or loss, but it may get you a complete refund of what you paid for a device if it fails due to a mechanical defect. The process of actually doing this and the level of protection will vary by the credit card you used. Some credit cards don’t offer this kind of protection at all. Discover is well-known for its warranty, which extends a full year beyond the manufacturer’s (given the manufacturer’s warranty was less than 36 months) and under the same terms of the original warranty. That’s actually a very legitimate question. Even assuming a relatively cheap plan, like AT&T’s at $7 a month, if you make a claim one year into your plan with a high-end phone that requires a replacement, you’re looking at a total insurance cost of $284, and a pretty high likelihood you’ll be getting a refurbished handset. If your handset is merely broken (shattered screen), you could actually be better off if you’d avoided insurance altogether, unless you plan on taking your chances with someone like Worth Ave Group. Phones with cosmetic or display damage – even a dead main board – can fetch a perfectly healthy sum on the open market, especially if it’s a popular device like a Galaxy S4. Replacement parts aren’t terribly expensive, and plenty of repair businesses will take these broken phones in, fix them, and flip them again on eBay or elsewhere for a substantial profit. Even if you get only $250 out of that shattered husk, you’re not down $250+ in insurance (let’s pretend you saved it instead), and for a little extra money ($100-200) you can get a brand-new phone of your choice instead of taking a chance on an insurance-supplied refurb or repair job (unless your insurer only pays out). But if your phone is stolen or lost, that’s a different story. Sure, the deductible is steep, but youwill get a phone, and it will almost definitely still be less out of pocket than if you didn’t have insurance at all. Like any kind of insurance, it’s a matter of weighing your perceived risk against the costs of coverage. If you really do fear that your phone will be stolen, or that you’ll lose it, insurance that protects you in such situations is probably worth the peace of mind for you. If you can work this kind of protection into a homeowners / renters policy, you’ll probably get a deal, too. If your concern is more about damaging your phone, buying a protective case and building up a ‘rainy day’ fund may actually be the better idea. After all, if your phone never breaks, you’re not in the hole for 2 years of premiums. All in all, if you or a loved one are particularly accident-prone with your smartphone, phone insurance can be an option worth exploring in some cases. Just remember this: like any private insurance, phone insurance is a profitable business for the insurer for a reason. Companies like Asurion or SquareTrade wouldn’t be around if they weren’t taking in more in premiums than they paid out in claims, and that means a lot of policies don’t end up ever actually being utilized. Consider the economics, the risks, and your personal situation – because it’s definitely going to vary from person to person. If you want an insurer with a good reputation for service and a quick claims process, your choices really do dry up rapidly – there’s a reason Asurion and SquareTrade are the only names most people know in the phone insurance business. Asurion is easily the most all-inclusive insurer on this list, since they cover not only damage, but theft and loss. And they’ll ship you a replacement phone the next business day after your claim is approved (or you can go to a store and pick one up in some cases). That’s convenient. SquareTrade is able to offer a pretty cheap plan (roughly $5 a month if you buy 2-year coverage) that covers the most common phone insurance claims: cracked displays and water damage. They have moderately quick turnaround and, in the event your phone is beyond fixing, they’ll just cut you a check – no dealing with lemon refurbs. I know, the conclusions aren’t exactly exciting – there’s no magic way to get super cheap, fast, and all-inclusive phone insurance. But it’s just kind of a reality of the very concept of phone insurance: a lot of people drop, submerge, or lose their $600+ phones. It takes a big insurer to make a profit out of that kind of business while still keeping customers who do file claims happy.